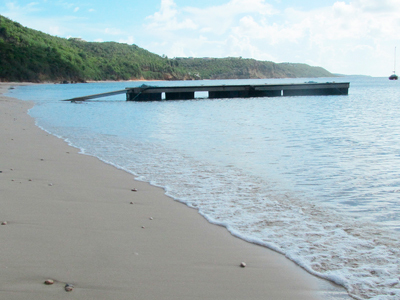 Do You Recognize Crocus Bay? 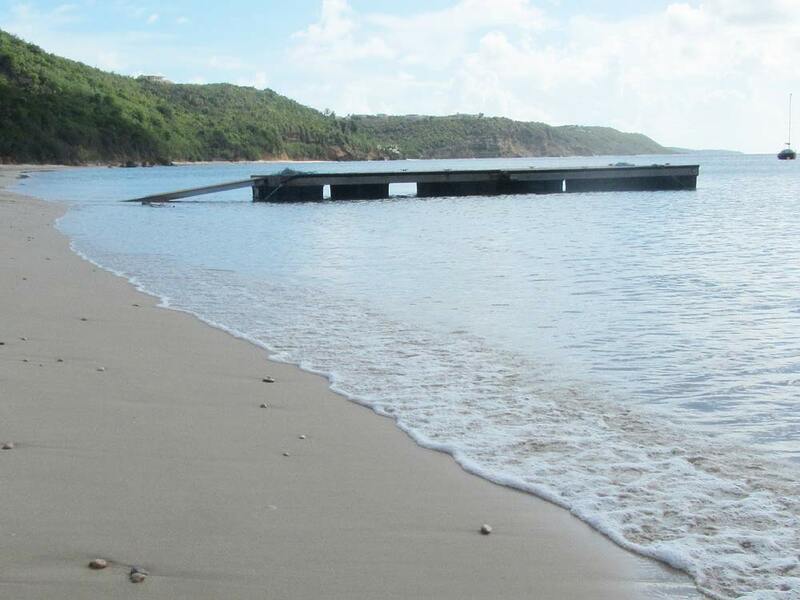 Over the past years, parts of Crocus Bay have changed, and parts have remained the same. Roy's is no longer here (it's moved to Sandy Ground). In its place is da'Vida Restaurant and Bayside Grill (you can see it in the photo above). Owned by the Lloyd family, da'Vida offers great sea-side dining for lunch and dinner. Their beach chairs are also available for public use, free of charge. They've also installed a floating jetty near the shore, where small boats can dock, or just have fun jumping off it (see photo to the left). Snorkel to the east end of the bay, you can even swim around to Little Bay if you want a little work out. Kayaks can also be rented from da'Vida at a reasonable cost. A luxury boutique hotel, C�Blue, sits high above the beach (see photo at top of page). C�Blue sits high above, overlooking the beach. The western end of the beach is as peaceful as it can be, looking the same as it did decades gone. Take a stroll down there. It's beautiful! You can see a little of it in the photo to the left and compare with the one below that was taken in the late 90s/early 00s. Directions: Signs to da'Vida are hard to miss if you are coming from The Valley. So, enter The Valley from the airport side and drive through the town (passing the Post Office). Keep straight. You will come to a round about. Go left. You will go past the Anguilla Tourist Board, Natural Mystic and Koal Keel. When you reach the top of the road you will see Red Cross. Continue straight down that hill past Red Cross. You're here! I just love every issue of The Anguilla News. My guess, as the overachiever tourist, is Crocus Bay. 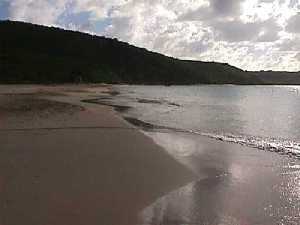 This classic beach is the closest to Anguilla's capital, The Valley. Crocus Bay is the site of an historic invasion by the French in 1745, as well as a protected anchorage for fisherman and yachstmen. Hello Bob. Greetings from Puerto Rico. 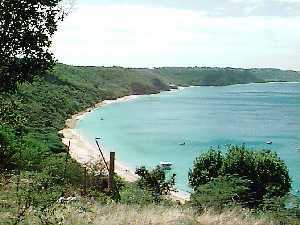 That beach is Crocus Bay, from where you can get a boat ride to Little Bay, enjoy snorkeling on the right hand side of the beach as you come down the hill or enjoy some fish and chips at Roy's. When me and my wife go there we are usually the only ones at the beach. Please do not spoil it by recommending it to tourists. Hit the link below for a photo of my wife Rosa at Crocus Bay. You are standing at Crocus Bay with your back to Roy's Restaurant and looking toward Masara Resort. As you walk away from Roy's in the direction of Masara the beach turns from wonderful sand to large rocks. Our sons, ages 10 and 11, have found marvelous fossils there; the fossils look like fat sand dollars and when we brought them back to the States and took them to the Smithsonian Museum to have them identified timewise, we were told they were quite old. Having taken college geology over 30 years ago, I can't remember which time period they came from, but they were thousands of years old. We were able to find these fossils without using any tools, although some were imbedded in large rocks, so we left those behind. No wonder our coming home baggage weighed so much. Say "hello" to Calvin, who runs a water taxi to Little Bay, walk to the beach, turn left and keep walking. You will need sturdy sandals if you intend to climb over the rocks to look for fossils. Many yachtsmen also anchor in Crocus Bay, so you will probably see some gorgeously expensive yachts at anchor. Crocus Bay is the home of Roy's Seafood Restaurant and bar, known for its British beers, seafood and Friday night half-price happy hour. 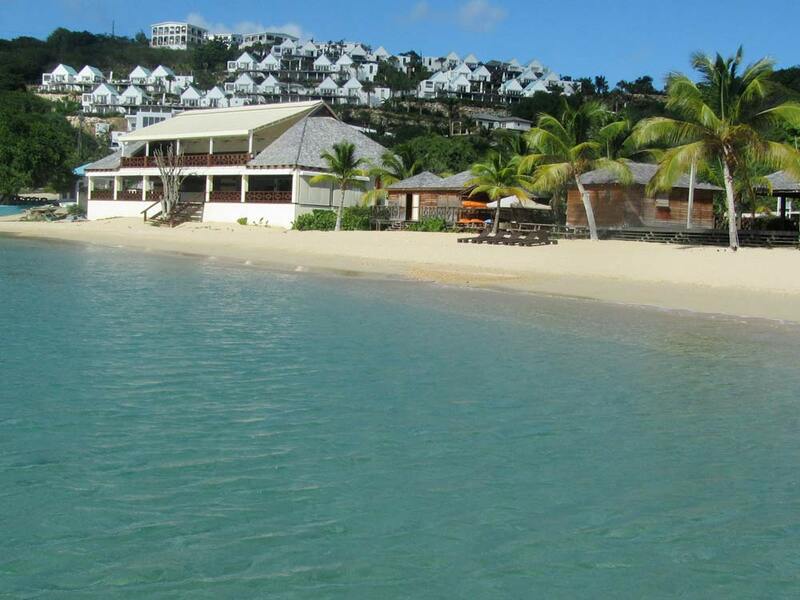 Snorkel to the east end of the bay, you can even swim around to Little Bay if you wish. Directions (Old): From the airport parking lot, take the only exit and turn left, then drive straight past Island Car Rental and the National Bank of Anguilla. Turn left at Barclay's Bank and Albert Lakes, proceed through The Valley. You will go past the library and the high school, through the intersection that used to have the "Traffic Experiment Roundabout", up the tree-lined Coronation Blvd., past Koal Keel restaurant, directly to the top of the hill with Lloyds Guest house on the left hand, and finally the steep slope to the beach. There is a parking area next to a small, white one-story building, across the street from Roy's.